Mel Gibson arrives at the Cinema For Peace event benefitting J/P Haitian Relief Organization on Jan. 14, 2012, in Los Angeles. 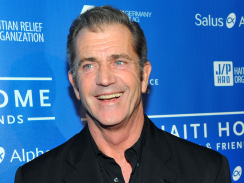 (CBS News) Mel Gibson is reportedly considering suing screenwriter Joe Eszterhaus for releasing a recording of another angry rant from the actor. The audio, which was obtained earlier this week by TheWrap, was allegedly recorded in December by Eszterhaus' 15-year-old son at Gibson's home in Costa Rica. In the recording, a man purported to be Gibson shouts at Eszterhaus for not delivering a script for their joint movie project, "The Maccabees." "What the f--- have you been doing?" he yelled. "I go to work, you're getting paid, I'm not! S---!" The rest of the recording contains much more profanity, ending with a string of F-bombs and a few other choice words. According to TMZ, Gibson's team is looking into the laws of Costa Rica to see if any were violated, or if his privacy was violated by the release of the audio. The website, citing "sources close to Gibson," says the actor believes he has a "basic human right" not to be recorded in his own home. Last week, Eszterhaus accused Gibson in a letter of making anti-Semitic remarks and raging against ex-girlfriend Oksana Grigorieva. The letter was written after the script for "The Maccabees" was rejected and the project was reportedly put on hold. Gibson responded in a letter obtained by the Los Angeles Times, in which he called Eszterhaus' claims "utter fabrications," and said his script was "substandard" and "a waste of time."